A permanent rail mounted alternative to a standard A2 rear sight or carry handle. 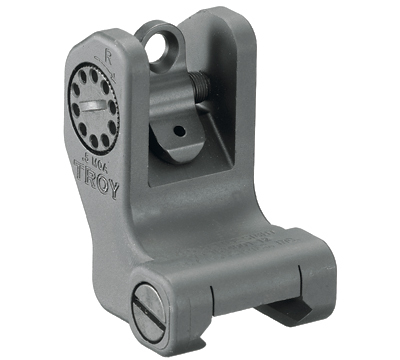 Provides constant access to fixed sights that continuously hold their zero. Made with aircraft aluminum with stainless steel components in black. Will not work with a railed gas block that is higher or lower than the receiver. Fits the SR-556®, SR-762®, AR-556®, SR-22®, and AR style of rifle with Picatinny rails on it. Made in the USA by Troy Industries.